Dig Spice, you can compare your driving not only with your rival, but also with famous drivers. You are able to download the driving data of famous drivers from the website. 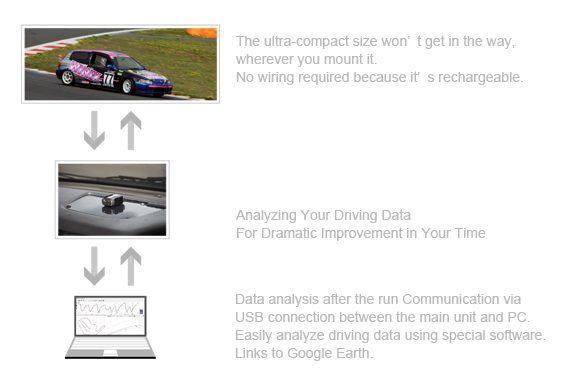 Dig Spice is very effective tool to analyze driving data, and it will help you to reach the next level. This will not be a fruitless effort. The main unit with its ultra-compact design can easily be installed where GPS signals are received, by using items such as double-sided tape. Rechargeable. No power source required. No troublesome power cables. Brush up your driving by comparing driving data with a rival. Compare a famous driver’s downloaded driving data with yours. Once data is obtained, you can do a precise analysis on yours, a rival’s or a professional’s driving data using your PC. 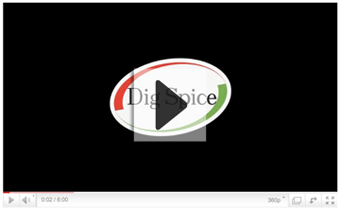 After obtaining data with Dig Spice mounted on a car or motorcycle, the data can be developed on the PC. Run an animation with multiple cars on a course to do an analysis by instinctively comparing points such as the difference in racing lines, the acceleration on the straight, and braking points. Use it in these situations to continuously refine your driving! Easily mount it on cars as well as motorcycles and carts. 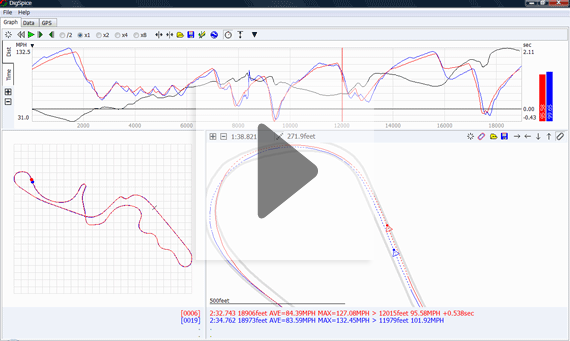 Easily analyze your driving on circuits, mini-circuits, gymkhana courses, and dirt trials. The description is only in Japanese. Which is faster, 2nd or 3rd gear for that corner? Which racing line is the fastest for that corner? With Dig Spice, you can set the sectors as you like to easily analyze driving data such as on double apex corners that require nonstop driving techniques. Data can be selected by lap for analysis, so you can change the driving style for each lap and easily do a detailed comparison. Where is that rival earning time? How is my racing line different from that rival? Obtain data by mounting Dig Spice on a rival’s car to match it up against your driving data. How do famous drivers take on a course? How different is a GT car compared to mine? Data for famous drivers as well as fast cars such as GT cars will be uploaded on a special Website as they become available. You can compare and analyze your driving against these data. Copyright © -2019-DigSpice Co.,Ltd. ,All rights Reserved.